My tears began to flow quite early on, as I tasted the delectable richness of the Scimudin (pronounced she-muh-deen in local dialect), an incredibly creamy cow’s cheese with just a touch of goat’s milk, from northern Lombardy. Life without cheese was going to be dull indeed. Wesson had chosen a sparkling wine, explaining that the “scrubbing bubbles” would cut the density of the cheese, but the wine itself was not to my liking at all, as I’m not a fan of sweet bubbles. For me, the subtle hoppiness of the beer was a better match, tempering the richness of the cream. I fell hard for the Tripel, as I’m developing a love for beers with a spicy finish. But against the cheese, a goat’s milk from Ariege, it just didn’t work for me. The wine on its own was perfectly fine to quaff, a decent blend of chardonnay and viognier. With the cheese, it was elevated to stellar. I was beginning to wonder, as with the previous smackdown, about the chemistry behind taste. 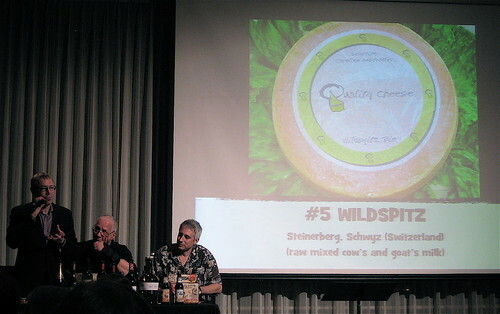 It’s fascinating how a decent wine can be transformed by a divine cheese, and how a beautiful beer can be killed by it. The mothership of dairy goodness has landed! 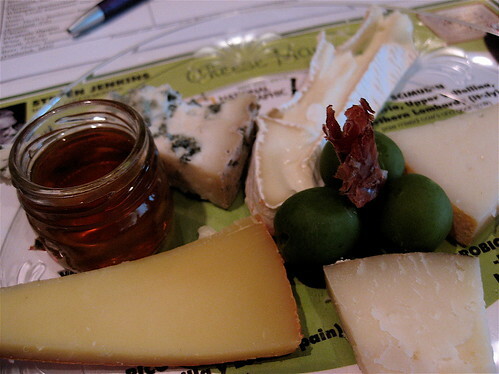 My table positively swooned over the Robiola, another outstanding cheese from northern Lombardy. Its ripe lusciousness was accented by a briny rind, washed in seawater. To match this you needed something that would yield, not punch back. The beer was fun on its own, but too challenged by the cheese. The wine, a very simple light-hearted pinot gris, was transformed by the pairing into something like silk velvet. At this point I wanted to marry master cheesemonger Jenkins (and not just because he silenced an increasingly rowdy room with aptly delivered snark). Because this sheep’s milk cheese from Valladolid in Spain was INCREDIBLE. I’m ashamed to say I can’t even recall the taste of the wine or beer for this round. The cheese stands alone. If there’s one thing that can make me forget my marriage vows to Jenkins, it’s barleywine (fast becoming my favorite ale). The toffee notes went beautifully with the wonderfully tangy mix of cow and goat’s milk cheese. But on its own merits, I really enjoyed the wine, a rustic red from Italy’s heel in Puglia. As Wesson quips at this point, “Oak is like makeup on wine,” and he proves it with the earthy negroamaro. Of all the wine he’s chosen this evening, it’s my favorite. Time for my last cheese, so perhaps I’m biased, but this sheep’s milk blue was so ridiculously good, a mouthful of spice and tang… if it was to be my last, it was worth it! The wine was not at all something I would drink on its own, far too sweet for me, but with the cheese it became transcendent. Tangy blue against sweet red wine makes glorious nectar! Though I adore porter, with this cheese it didn’t do it for me. So, after all this cheesy alcoholic goodness, who won? Did wine or beer come out ahead in the battle to pair? Well, neither made it out obviously ahead. Every round appeared a draw, as with a crowd this large, a show of hands didn’t really present a scientific result. I felt that wine won, but note I was without beerlover Kirk to sway my opinion! What was apparent? The pairing of food with wine and beer is an art form of an intensely personal nature. Your palate is different than anyone else’s. But Wesson made a brilliant analogy that’s quite helpful to remember: Pairing food is like pairing couples. You can either complement or contrast. If you contrast, it’s like when you’re attracted to someone who’s your opposite, and then together bring out the qualities in each other that you lack on your own. If you complement, it’s like when you’re attracted to someone similar to you, and then together strengthen the qualities you share. Both have their merits, it just depends on your mood. And above all, remember – it’s fun! Many thanks to Stephanie Montgomery and National Geographic Live for inviting me to attend gratis. Watch for our monthly round-up of events and ticket giveaways!